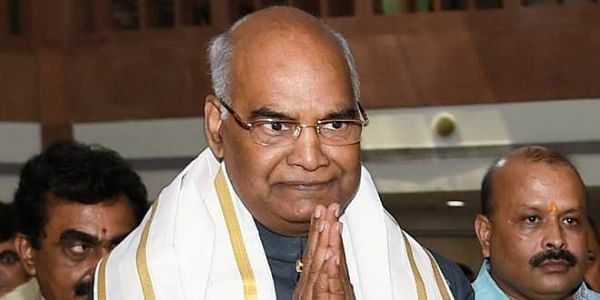 President Ram Nath Kovind, on his first visit to Madhya Pradesh after assuming office, was given a guard of honour at Raja Bhoj Airport. BHOPAL: President Ram Nath Kovind, on his first visit to Madhya Pradesh after assuming office, was given a guard of honour at Raja Bhoj Airport. On the first day of his visit, Major General AH Chauhan, Chief of Staff of Sudarshan Chakra Corps escorted the President to the saluting dais, where an Army unit gave him the guard of honour. The President then reviewed the parade commanded by Major Vineeth Nair. President Kovind also graced the Sadguru Kabil Mahotsav in Bhopal and addressed the public there. Later in the day, he paid tributes to Rani Jhalkaribai at her statue in Bhopal. Tomorrow, the President will address the 2nd convocation of the Indira Gandhi National Tribal University at Amarkantak.